The Breville Mini Smart Oven® — The ‘A Bit More’™ button and the Frozen Food button, the Mini Smart Oven® can toast up to four slices of bread to perfection or even cook an 11″ pizza. This oven is a versitile and powerful addition to any counter top. A. Door handle. B. 10” x 10” enamel baking pan. C. Ribbed plate warming tray. D. Top rack height position. E. Middle rack height position. F. Bottom rack height position. G. Ventilation slots. H. Breville Assist™ Plug. I. LCD screen. J. Wire rack. 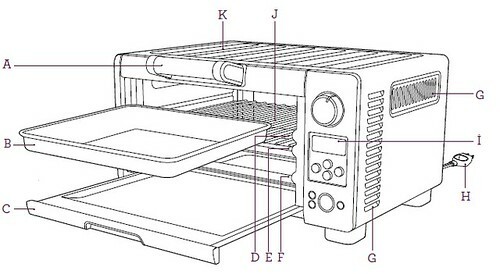 K. Ribbed plate warming tray. 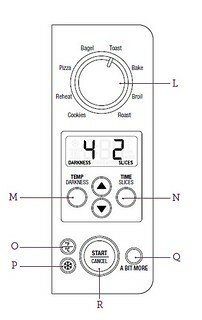 L. Function Dial. M. Temperature/DARKNESS Button. N. TIME/SLICES button. O. Temperature Conversion Button. P. Frozen Food Button. Q. A Bit More button. R. START/CANCEL Button.